Why do so many people from all over the planet fall for Oreo cookies? If you mention its name to people - their age, gender and location do not even matter – they basically have the same reaction. They look like Christmas has come early. The carbs and the extra calories are worth every pound that is added to their weight. Another thing that individuals like about the brand is the promotional ideas they sometimes utilize to market the products. 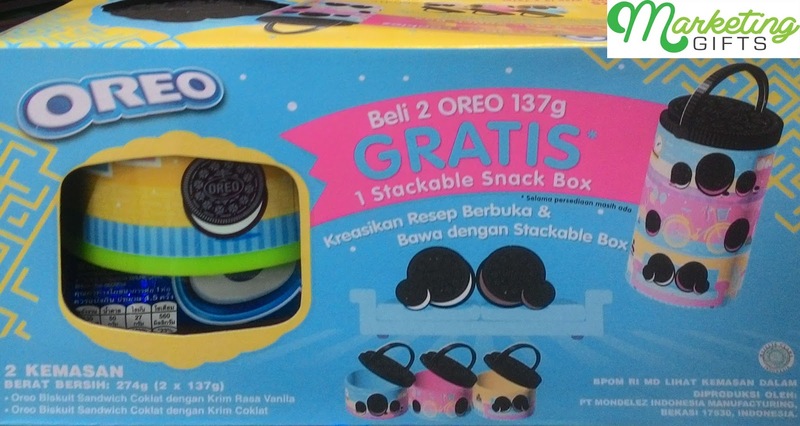 This is the free snack box from Oreo. Stacked. This gift with purchase is practically one piece of the puzzle which you may or may not want to put together. You can use it on its own, or purchase others to get three layers of boxes. Customized. The lid of the free snack box is shaped like a cookie. Making it unique is not going to be a waste of time, if its consequence is gaining more customers and sales. This is a good practice rather than just giving away pen, shirt, or other common GWPs. Branded. The branding of Oreo in the promo gift is remarkable as well. They have not been contented by only putting O-R-E-O on it. They have gone all out to print images of the cookies on the body too, so that even kids can recognize them. Visualize strategies at the Marketing Gifts blog now.